Image of the Day: The “Eye of Sauron” –Was it Spawned by a Dark Star? Dark matter not only had a role to play in fueling early primitive stars, it may have created "dark stars" so massive that they went on to spawn supermassive black holes found at the cores of the one trillion galaxies estimated to populate the universe. 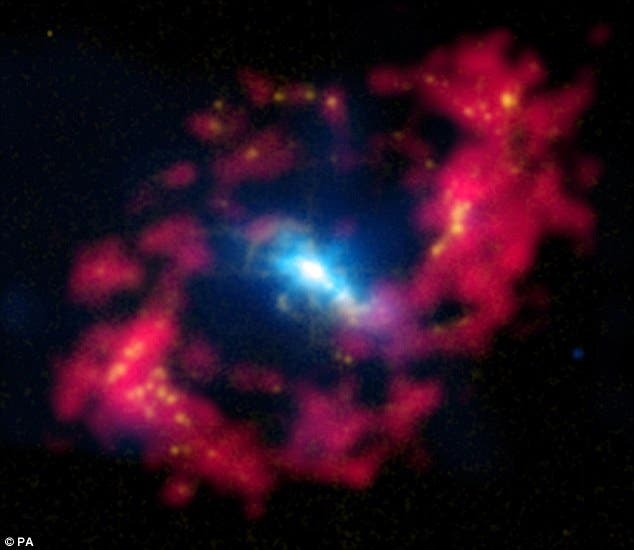 NGC 4151, the Eye of Sauron, shown above, is one of the nearest galaxies to Earth to contain an actively-growing black hole the center of this active galaxy 43 million light years away from Earth. Scientists believe powerful X-rays generated by the super-massive black hole produced the bright blue ‘pupil’ of the eye caused by matter falling into the black hole. Katherine Freese, Associate Director of the Michigan Center for Theoretical Physics, has been working to identify the dark matter and dark energy that permeate the Universe as well as to build a successful model for the early Universe immediately after the Big Bang. Freese has shown that most of the mass in galaxies does not consist of ordinary stellar material, and has proposed ways to look for alternatives such as supersymmetric particles. Currently there is a great deal of excitement about possible detections of these particles. In the first phase of stellar evolution in the Universe may have been powered by dark matter heating rather than the current popular theory of nuclear fusion. The power source was the annihilation of WIMPS (Weakly Interacting Massive Particles), which are their own antiparticles and may be discovered by ongoing searches at CERN's Large Hadron Collider or at experiments at FREMI/GLAST. The "dark star" hypothesis proposes that the very first stars, formed when the Universe was far smaller than it is now, had a greater dark matter density to play with. Of all the incredibly odd properties dark matter has, one of the most interesting is how it acts as its own antiparticle — if two dark particles hit they'll explode into pure energy. Why doesn't this cause the entire Universe to explode? Because dark particles are thought to be WIMPs, Weakly Interacting Massive Particles — they find it very hard to even interact with each other, never mind anything else. If there were plenty of dark matter surrounding dark stars, they could have enough fuel to be sustained for millions (or possibly billions) of years. NASA's James Webb Space Telescope (JWST) might be able to spot the biggest dark stars on the edge of the observable Universe after it's launched, providing Freese and her team with observational evidence that dark stars even existed, let alone helped to spawn supermassive black holes. Image at top of page: Images from the Chandra X-ray space telescope and the one-metre Jacobus Kapteyn Telescope on La Palma in the Canary Islands were combined to create the stunning picture.